We had ten riders today for Toronto’s first ride of the season, including two riders who are new to the club. 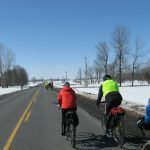 Peter and Peggy were looking good on their tandem, and Phil decided to work the Oak Ridges Moraine on his fixy. Thanks to some timely “local knowledge” input from Fred and Henk, we switched the route up to avoid a large section of muddy gravel in the Holland Marsh. There has been an ongoing project to move the canals around, and this has left Wist and Canal roads in a pretty bad state. Since everyone had cleaned their bikes up to look good for the first ride, it was quickly decided that avoiding large amounts of mud was a good thing. The weather was a factor, with strong headwinds and temperatures around 0 C for the ride up to Bradford. 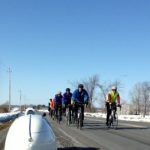 After a brief stop to refuel, we headed back over the rollers on Keele with a nice tailwind to help us along. This was also Toronto’s first advertised “no-drop” ride. We had a new member turn out specifically because the ride was advertised as no-drop, and we expect to see more of him this season. Other than needing to find someplace other than Timmy’s to stop at in Bradford, it was a great start to the season. I got 8 of 10 riders posed for a picture at the start. From the left 2 new members Guy Fortin and Nicholas Piper beside Daniel Wilson and Helene Letour guests from Ottawa Bicycle Club. Next is Guy Quesnel, Alain Couet, David McCaw and Luc Fournier beside his velo mobile. Alan Ritchie joined the ride as we departed and the photographer was Peter Grant. The next pictures tell the story. We enjoyed the bare pavement, open roads, and bright sunshine of a late winter day. Endless fields still lay deep in snow south of Ottawa holding the air temperature at 0C. With 1 stop for home made cinnamon buns at Winchester the group made its way back to Osgoode by 12:30. Everyone had a good time and were happy to escape the bonds of winter.